Discover how to reveal hidden profits for your pet related business. 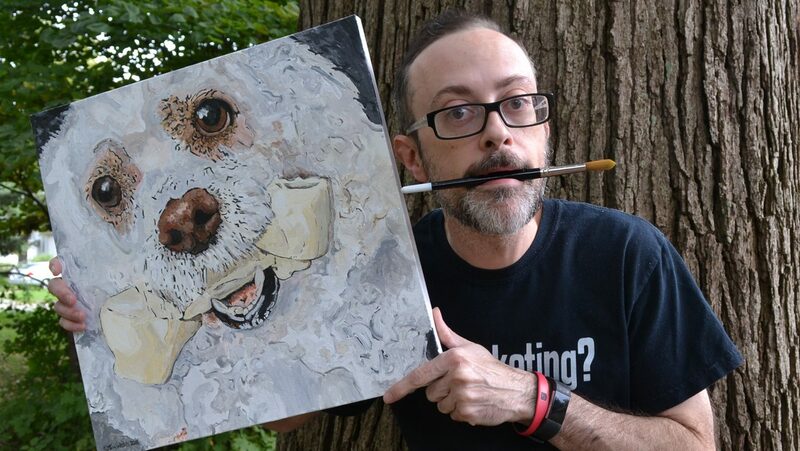 In early December of 2018 Tim Welch Art introduced the pet business promotion where any pet related business gets a 10% commission on any customer they refer to this site that makes a purchase. You read that right, 10% commission goes to any pet related business that refers a customer to Tim Welch Art for pet portraits and the average sale is $500. So that means you get $50 on average for each customer you refer. The best part for you is that the work sells itself when it’s hanging on the wall in your shop. This gouache on paper painting is just one example out of many for what’s possible for you to have hanging in your dog grooming shop or whatever pet related business you have. As a big believer in the law of reciprocity we feel that it’s more than fair to share our profits with the great people who bring us so much business. Tinkerbelle the dog here, all decked out in Gucci is from a picture posted on Instagram. It serves as a little bit of an extreme example and a depart from what I usually do but I felt the picture was so awesome I should just paint it like it is. Most of the time snapshots from your phone make the best paintings and your customers will love seeing the artwork hanging in your shop. We already know if you have a pet related business that people LOVE their pets and definitely spent a lot of money on them. After all, they are like family to most people and they bring us so much joy and happiness. Get in touch with me right away and I’ll get you set up for referral earnings today!